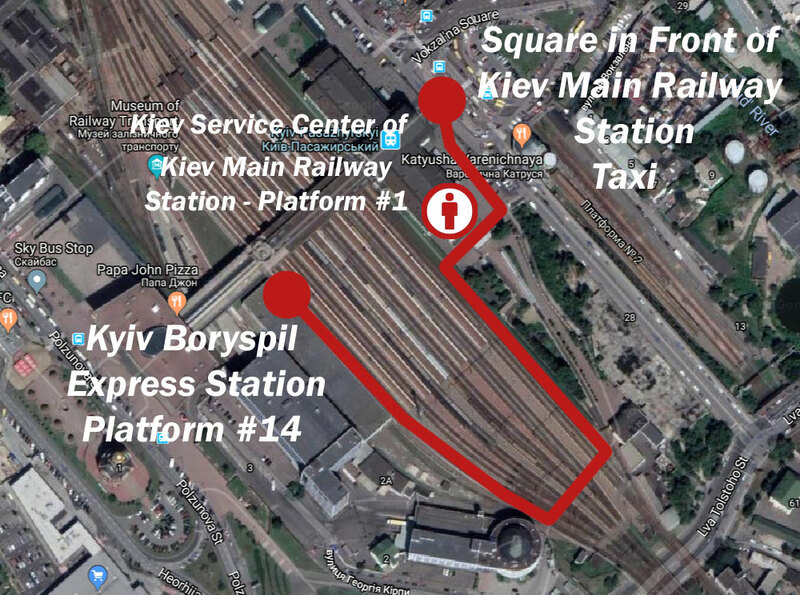 After 30.11.2018 in Kiev put into operation Kyiv - Boryspil Express Train with convenient train schedule connecting Boryspil International Airport (KBP) and Main Railway Station. 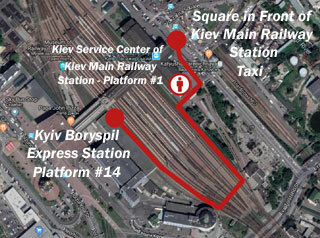 The time of one way train ride is around 38 minutes and the new transport connection let passengers of KBP airport reach Kiev city center without waiting in traffic jams from the left bank of Dnieper river in the morning and from the right bank - in the evening on the way back to KBP airport. 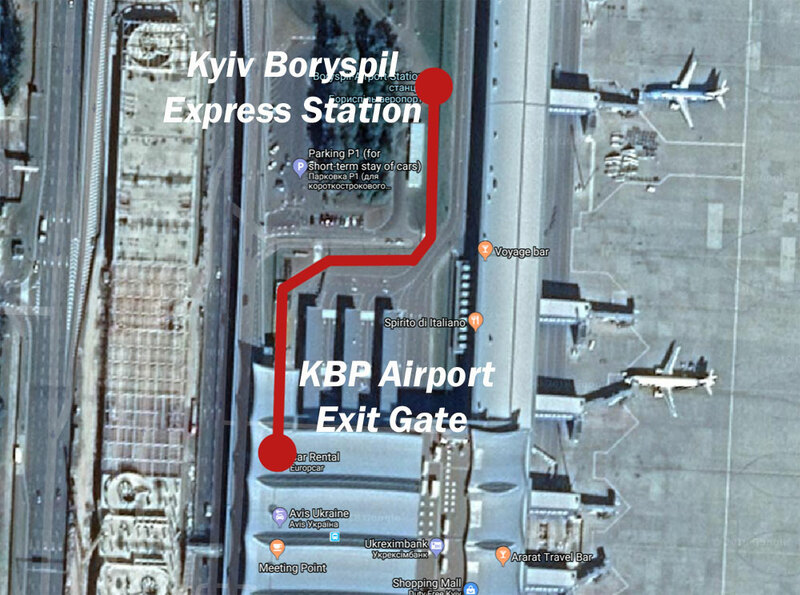 On base of the train schedule Kyiv - Boryspil Express Train operates every 30 - 120 minutes with more train runs in peak load time of Boryspil International Airport (KBP). 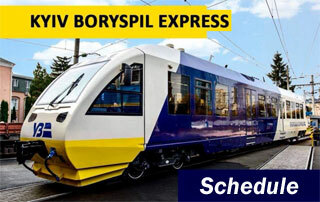 Special terminals for sale of Kyiv - Boryspil Express Train tickets by credit cards are installed at Main Railway Station in Kyiv and at Boryspil International Airport (KBP). Guests of Ukrainian capital could purchase train tickets paying in cash in two special cash desks at Main Railway Station. Kyiv - Boryspil Express Train fare is 80 UAH (around 4 Euro per ticket). Four train buses of brand Pesa Bydgoszcz SA operate on route Boryspil International Airport (KBP) - Kyiv Main Railway Station - Boryspil International Airport (KBP). In Kyiv Main Railway Station built two waiting rooms for passengers of the train. The lounge is air-conditioned and has modern TVs, LED lighting and Wi-Fi Internet, equipped with comfortable seats, sockets for recharging mobile devices and special area for children. Entrance to the lounge will be made in presence of train tickets. 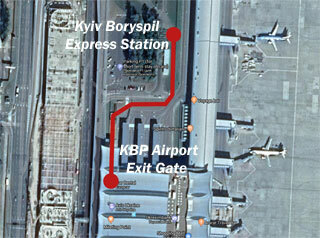 KBP Airport Station of Kyiv - Boryspil Express Train has comfortable ramps to get from the airport exit gates to the express train with assistant of KBP airport service for passengers with reduced mobility. If you did not order their service while purchasing flight tickets - you could call the service staff by number: +38 063 980 67 49 (24 hours / 7 days a week). On the platform you need to ask for help of the assistant of train driver who has special removable ramps that let you to board the train by the wheel-chair. 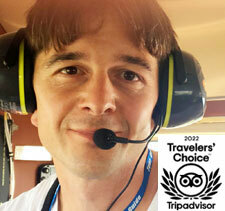 At Kiev Main Railway Station the assistant of train driver could help you to get out of the train. Next there is only way to get to the central entrance of Kiev Main Railway Station (without climbing stairs to the second floor) is to use ground passage at the end of Platform #14 that leads to Platform #1 (could be hard in winter time as part of the passage is in snow and it goes over train rails, better to have a person that helps you to pass that passage, for example, the staff of Kiev Service Center of Kiev Main Railway Station could help you - call the number +38 (044) 465-20-80 in advance, the service is for fee and also they could order the taxi). Next from the central entry of Main Railway Station you could take the taxi to your hotel or apartment (the best if the wheel-chair is folding). To find the right car could be a bit hard as most of the taxi drivers has standard cars - not vans, the best is to use Uber taxi service with option of Uber Van (swipe right in the app when see the options of taxi fares). You welcome to take new high speed train from Boryspil International Airport (KBP) and reach the city more comfortable way as well as catch your flight from KBP airport in time!